Contrary to what some people think, plaque and tartar are not exactly the same. At Main Beach Dental, we’d like to take a moment to tell you more about plaque and tartar, and remind you why professional cleanings are so important. Plaque is the film of bacteria constantly forming on your teeth. Plaque is like something from a horror movie – it is always growing: it grows after you eat, while you sleep, during class, and in conversation– it never stops. Tartar is the leftover plaque on your teeth combined with additional bacteria, and your saliva. If left alone for more than 24 hours this mix creates a hard mineral deposit on your teeth, which acts as a breeding ground for other bacteria. Excessive tartar may lead to periodontal disease and other dangerous conditions. So, let’s take a look at some of the causes and treatments of plaque and tartar, so you know what you can do, and what we can do as dental partners in defeating plaque and tartar. 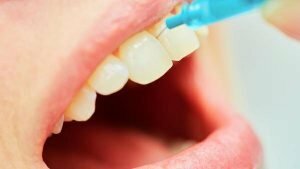 What causes dental plaque and tartar? When saliva, food, and fluids combine in your mouth bacteria grows and deposits on teeth and gums and especially where the teeth and gums meet. Common foods that contribute to plaque formation and growth include those containing carbohydrates or simple sugars found in soft drinks and candy. Plaque hides between teeth and under the gum line. There’s no way to avoid it entirely so it’s important to maintain a good oral routine to keep it from accumulating. This means regular brushing, flossing, and visits to the dentist. Brushing and flossing. Brushing and flossing can keep plaque under control. But if you notice extra plaque buildup, there are additional at-home remedies you can try in order to remove the plaque from your teeth. Before selecting an at-home remedy, make sure to check with Main Beach Dental to be sure it is safe and effective. Plaque-fighting dental products. Some specially formulated dental hygiene products contain tetrasodium pyrophosphate, which can help control the buildup of plaque and tartar. Special mouthwashes and tootphastes help control tartar buildup by interfering with calcium and magnesium from affecting your teeth. Once again, consult with us before use, and use these products only as recommended. Water-flossers. A water flosser is an at-home cleaner that sprays water in between the teeth and gums. A water flosser cleans the teeth differently from traditional brushing and flossing because it uses water to push plaque from the teeth and can reach areas that brushing and flossing cannot. Locate plaque using a stain. Plaque is extremely difficult to see, so it can be hard to know how much is on your teeth. To see your plaque you can purchase “disclosing tablets”. These tablets stain the plaque on your teeth, making it easy for you to examine your teeth for plaque and identify the areas you need to target with a toothbrush or floss. While no at-home remedy can substitute for what a professional dental cleaning can remove, taking steps to prevent plaque is a good way to keep your smile healthy and keep tartar away. Tartar cannot be removed at home. This is why eliminating plaque is so important at home, as it can stop tartar from developing. If you do suffer from tartar buildup, you must visit your Main Beach Dental dentist to have it removed. Tartar removal is done by a scale and polish, which can be performed by your dentist or hygienist. During scaling, your dentist may use an ultrasonic scaler, which is an electronic scaler that removes larger pieces of tartar using a gentle sound vibration, coupled with a stream of water to wash debris away. Following this, your dentist will use a handheld tool to remove tartar from tooth surfaces. If the amount of calculus is minimal to begin with, a manual scaler may be sufficient to remove deposits of tartar. Tooth polishing treats the tooth surface with a rubber motorized cup containing an abrasive polishing compound. While polishing removes stains leaving teeth bright and shiny, it is not just a cosmetic procedure. It also smoothes away minor imperfections and patches of rough texture. By making the teeth smoother, it becomes more difficult for plaque to stick in the future. Your dentist will advise you how often you should have a scale and polish and may recommend a specialty toothpaste intended to help deal with plaque and tartar deposits. Get your FREE dental consultation.